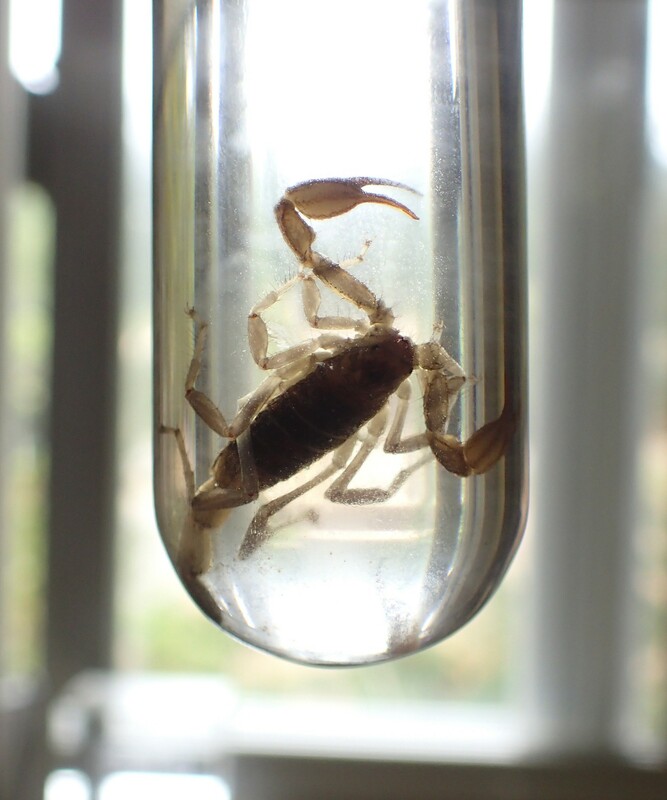 Scorpion in acetone to remove fats from body. Lately, events have me laboring at the tedious process of “pinning” a few insects. I typically prefer to photo document, but the tiger moth was nearly dead when I found it and I felt it would have been a waste just to let it decay away. The scorpion and velvet ant were from out of the area, and I didn't want to release them into our part of the country. The black widow spider, well, I just couldn't see letting it go anywhere near me. I am delighted to find I still have the skills I developed in my grade school years. The first and last step in collecting should be taking and recording data. With proper labeling, even a small private collection can be scientifically relevant. Without it, our labors are ornamental, like tiny stuffed deer heads on a wall. 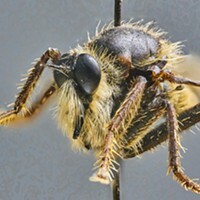 Fortunately, modern digital photos can record the insect, its environment and even the GPS coordinates. Temporary box, note the notes with each specimen. The first physical step for either kind of permanent display is killing the bug. It is best to do this quickly so the specimen does not damage itself. I generally use a strip of corrugated cardboard saturated with several drops of the solvent ethyl acetate in a glass jar. It is available from various supply houses, such as BioQuip. Acetone fingernail polish remover will do in a pinch but works more slowly. Some folks freeze the subjects to death in the freezer, eliminating the need to handle solvents and allowing them to delay pinning to a convenient time. Some insects will discolor from freezer burn if left too long. Don't be too eager to pin your specimen. Even if it is immediately immobilized, I usually leave it in the jar for 24 hours or so. Having one resume moving once you've skewered it on a pin is terrible. Most adult insects will dry to the consistency of potato chips in a week or two. Once dry, they will hold their shape indefinitely, if properly cared for. It is up to you to position them according to your taste before they dry. There are a few accepted norms. For insects, pinning through the thorax is customary, and placing the pin off center (to the right) is accepted to avoid obscuring any structure on the centerline of the subject. Some insects with a high fat content in their bodies can darken like a brown paper bag full of French fries. To avoid this, soak them in acetone for several days prior to pinning. Acetone also speeds the drying process because the water in the body is diluted and dispersed in the acetone, leaving less to evaporate through their integument. Velvet ant pinned. This is not an extraordinary number of pins. Body parts you want to position can be supported by pairs of pins crossing under them. In a pinch, I've used styrofoam and corrugated cardboard to pin on, but balsa wood is by far the best. Speaking of pins, there are specialty entomological pins. The old-school variety are lacquered black, while new ones are stainless steel. 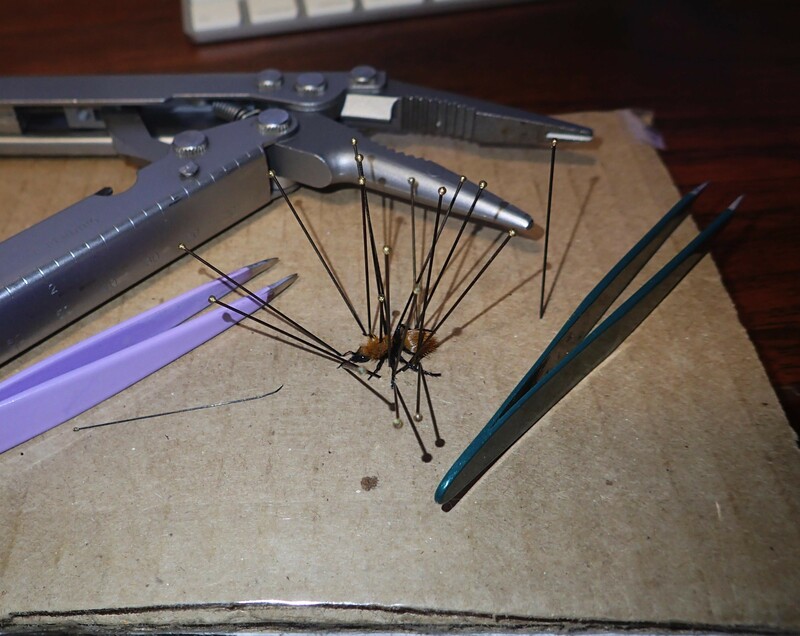 Regular sewing pins can corrode over time when exposed to body acids. Any specimen the wings of which you wish to display (think butterflies) requires special care. Wings are covered with easily dislodged scales so careful handling is the rule. 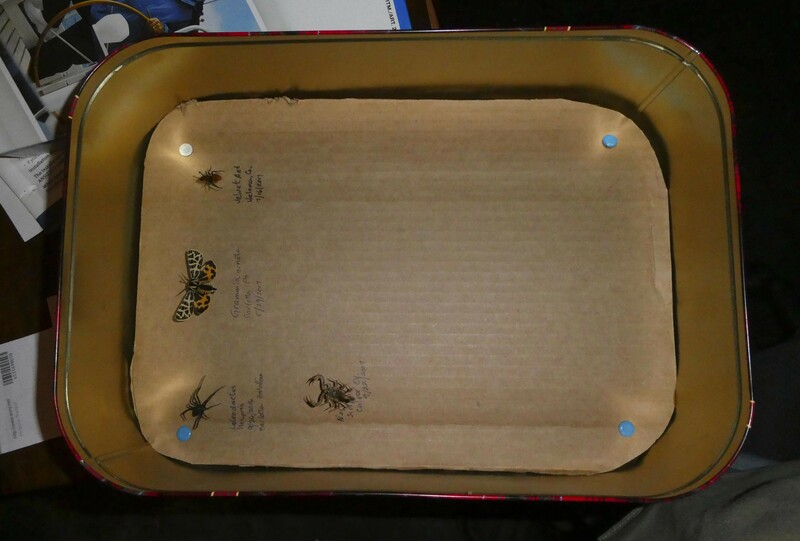 The wings are positioned on a “spreading board” at gentle angles and held down with strips of cardboard, which are in turn held in place with pins. 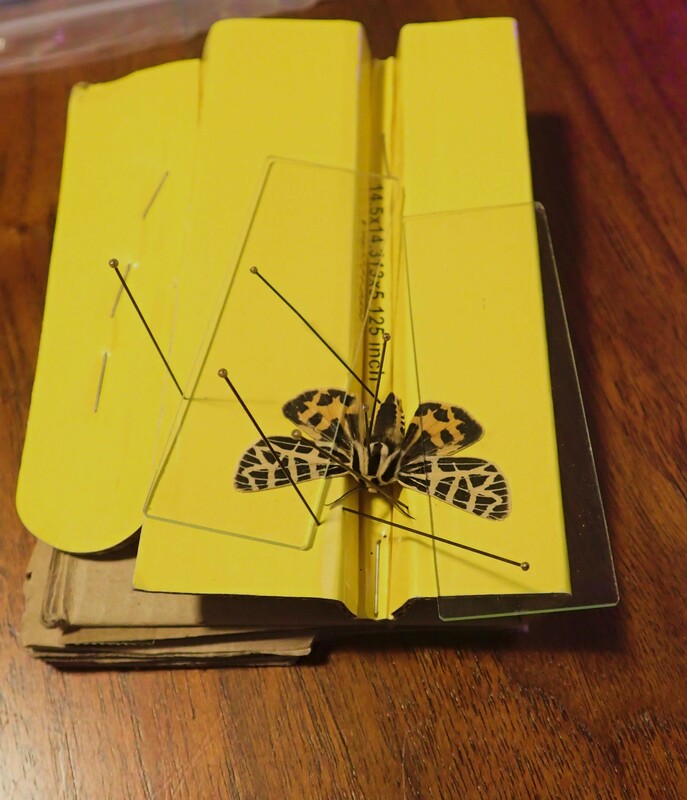 Tiger moth pinned with glass microscope slides hold wings in place. Insects too small to pin conventionally can be attached to a tiny point of paper with glue, which is in turn held in the display with a pin. Soft bodied specimens, like termites and many larvae, can be preserved in small vials in alcohol. Many people put small collections in cotton stuffed Riker mounts. I prefer glass-faced museum cases or even an old cigar box with styrofoam on the bottom because you can leave specimens on the pins. If you need to handle one for any reason, the pin makes a safe and easy handle. Finally, mounting a mothball on the end of a pin is a convenient way of fumigating the collection, protecting it from beetles and mites that would otherwise dine on your subjects.